In the language of roses, the yellow rose represents "friendship." Yellow roses provide a bright spot in the garden, and some types are easier to grow than others, so look for the right type for your growing conditions. 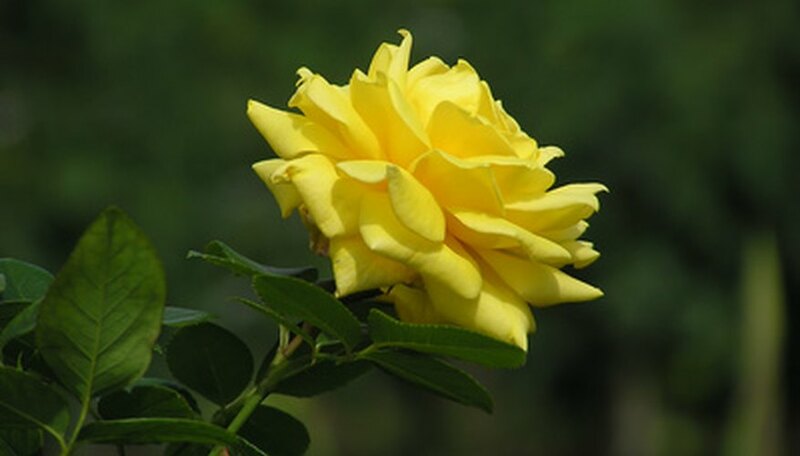 If you are thinking about planting a yellow rose shrub, there are many varieties to choose from within each type. The climbing yellow rose is the type that grows best if supported with a trellis, fence or stake. It often produces clusters of flowers several times during the season if pruned properly after each bloom period. Most varieties are vigorous growers if planted in a sunny location with plenty of organic matter in the soil. Some popular varieties of climbing yellow roses are the Golden Showers and the Lady Banksia Rose. Heritage roses are grown for generations on their own rootstock. This means the root system of one rose bush is not grafted onto the top portion of another rose to combine desirable characteristics. Heritage roses are considered tolerant of disease and insect pressure as well as extreme cold or heat. The blooms of heritage roses are sometimes smaller than other rose types and often have only one row of petals in each flower. Heritage roses are often called old-fashioned or heirloom roses. Examples of yellow heritage roses are the Baby Love, Mermaid and April Moon varieties. Yellow hybrid tea roses are most often used for cutting. Hybrid tea rose bushes produce large multi-petaled blooms on long erect stems. Many hybrid tea rose bushes have higher maintenance requirements than other rose types. For example, they require regular spraying for mildew and fungal diseases and for pests such as thrips that affect flower quality. Some varieties of yellow hybrid tea roses are the Radiant Perfume, Welcome Home and the Midas Touch. Old garden roses are not improved or hybridized over many years and still hold the same outstanding features, such as resistance to disease and strong fragrance. There are single-petal or multiple-petal blooming varieties available. Some varieties of old garden roses bloom once during the season while others are repeat bloomers. Examples of old-fashioned yellow garden roses are the yellow Noisette rose, which is a climbing rose, and Harrison's Yellow Rose. Floribunda rose bushes produce flowers in clusters rather than on individual stems. Also, floribunda roses are repeat bloomers, providing color throughout the growing season. The Julia Child, Amber Queen and Honey Perfume varieties are good examples of attractive floribunda rose selections. Yellow miniature roses are rose bushes developed by plant breeders to remain small in size in the garden, but they are usually planted in containers. Potted miniature roses are often carried by florists and nurseries to be given as gifts. Some examples of miniature yellow roses are the Baby Love Miniature shrub rose, Sunbeam and the Rise 'N' Shine.